Print n Share is an iPhone and iPad app developed byEuroSmartz Ltd. 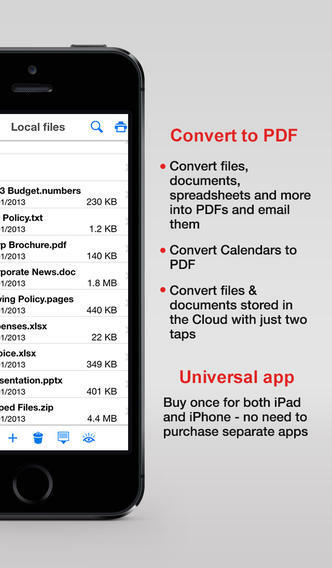 This handy app allows you to print anywhere, without needing to use a computer or AirPrint. Print n Share claims to allow its users to print directly to the “widest range of network/WiFi printers.” This app also has some handy document management abilities, including the ability to zip or unzip files directly on your iPad/iPhone/iPod, quickly search the document for keywords, or convert docs into handy PDF files. Overall, this app has a great, clean, and simple interface. The app has a very professional look, and it makes it so simple to select your paper size, adjust your document orientation, set margins, and look at a print preview before actually printing the doc. The newest version of the app is Version 5.5. This version of the app has a ton of upgrades, including an iOS 7-inspired UI and full iOS 7 integration. In addition, the latest version of Print n Share plays nice with POP accounts, SugarSync, and cloud servers…as well as the handy ability to increase the size of a font when reading your emails. Cloud services that are supported in Print n Share include CloudMe, Box.net, Dropbox, Google Drive, iCloud, SugarSync, ShareFile, SkyDrive, FTP, and WebDAV. Of course, you can use Print n Share to print from any other apps using “Open in…” If you have been struggling to print with ease from other apps, Print n Share makes it simpler than ever before. Whether you need to print a document, shipping label, photo, or calendar page, Print n Share makes it easy to print the files you need, no matter where you are. For anyone who is constantly on the go, but still needs to print documents frequently, this is a must-have app. 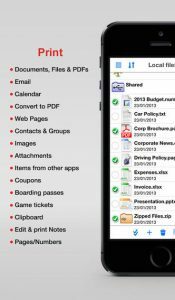 Print n Sharerequires iOS 4.3 or later. Compatible with iPhone, iPad, and iPod touch. This app is optimized for iPhone 5.